Classic book by Elizabeth Perry on working-class formation during the industrialization of Shanghai from 1839 to 1949, including insight into the strike wave and insurrections of 1926-1927. This book is in PDF format below, and it is also online here. We heartily recommend you purchase it from the publisher here. Chapter 4 ("The Heyday of Radicalism, 1919-1927") is of special interest for its insight into the background of the Shanghai strike wave and armed insurrections of 1926-1927 (sometimes called "the Shanghai Commune"), and the subsequent Shanghai Massacre of 1927. This work is an important addition to the rather limited literature on the social history of China during the first half of the twentieth century. It draws on abundant sources and studies which have appeared in the People's Republic of China since the early 1980s and which have not been systematically used in Western historiography. China has undergone a series of fundamental political transformations: from the 1911 Revolution that toppled the imperial system to the victory of the communists, all of which were greatly affected by labor unrest. This work places the politics of Chinese workers in comparative perspective and a remarkably comprehensive and nuanced picture of Chinese labor emerges from it, based on a wealth of primary materials. It joins the concerns of 'new labor history' for workers' culture and shopfloor conditions with a more conventional focus on strikes, unions, and political parties. As a result, the author is able to explore the linkage between social protest and state formation. Perry's book (co-written with Li Xun), Proletarian Power: Shanghai in the Cultural Revolution, is also recommended as a follow-up to this study, about how working-class composition developed in Shanghai after 1949, focusing on how it briefly began to form an autonomous power in 1966-1967. (Yiching Wu's new book Cultural Revolution at the Margins updates that research; we will repost an interview with Wu from the forthcoming Chuang journal in spring 2015) Jackie Sheehan's book Chinese Workers: A New History (on Libcom here), continues this history up to the 1990s (although in much less detail than Perry's two books), but we are not aware of any good studies of Shanghai workers since the 1990s. (Let us know if you can recommend anything.) 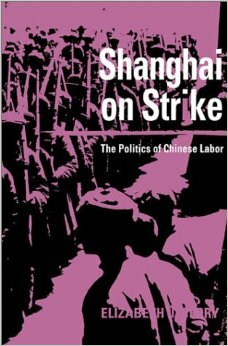 Also see our brief report on a strike in Shanghai earlier this year. As for more focused studies of the Shanghai insurrections of 1926-1927, we don't know of anything better than chapter 4 of this book and chapter 7 of Harold Isaacs' much-dated book Tragedy of the Chinese Revolution. Let us know if you can recommend anything else. It's a while since I read it, but I seem to remember it talks a lot about the how the development of class consciousness amongst the workers was strongly intertwined with nationalism, and how the workers were strongly divided along the lines of the different regions within China that they came from. S. A. Smith also wrote the really great book about workers' power at the point of production during the Russian Revolution, Red Petrograd back in 1983 - see here.